Megan was the best photographer we could ask for. She came highly recommended from a friend, and I can see why. Her photos are wonderful, and she made the process painless. She even got all the posed pictures we wanted done ahead of schedule—we didn’t have to stand around and smile until our faces hurt, and we got done early to go party at the reception! She was very easy to work with and so fun to hang out with. It was well worth the cost. Megan you are absolutely incredible!! I had no doubt in your talent, but you surpassed any expectations that I had. The moments you captured were beyond perfect, I am having a hard time picking favorites. These will be cherished for decades to come. I have heard from everyone how comfortable you all made them feel. I can’t thank you enough for everything, you are meant for your career. We hired Megan as our wedding photographer and she did not disappoint. Everything was outstanding, from our engagement session to our wedding day. Megan is kind, passionate, and very talented. I would highly recommend choosing Megan Lee Photography. Megan really got to know us through the initial meeting and by taking our engagement photos. We were very pleased with her efforts and those of her partner in being flexible as well as in-tune to our needs and the moments we wished to capture. Our wedding photos turned out great and we are left with many captured memories that we can enjoy for years to come. We highly recommend Megan Lee Photography! This review totally made my day! I lovedlovedloved being there for your beautiful wedding day and getting to know you and your family. Thank you so much! Words can't even express how thankful my Husband and I are that we chose Megan Lee Photography for our Engagement and Wedding pictures. Not only does she go above and beyond the job, but her personality encompasses everything you'd want a photographer to be. She truly cares, and that shows in her work. Absolutely stunning! Megan did an amazing job!!!! I loved all the pictures she took. Thank you Trynity! You were a stunning bride! Megan is a wonderful photographer! She is sweet with kids & very accommodating. She takes pictures that show your family members' personalities. And her editing is amazing!! So, so beautiful! Pricing is reasonable as well. You will not be disappointed! She was awesome! Highly recommend! Megan was awesome! My wife and I had done a small fall shoot with Megan and I walked away wishing we had hired her for our wedding. It is plain to see the passion Megan has for capturing beauty. She made the session painless and actually enjoyable. 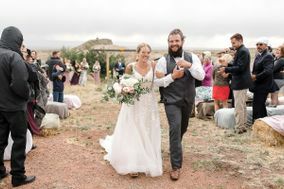 Make sure you have a list, fore sure if you are going to do the couple pictures after the ceremony and make sure you pay attention to detail , like how clothes are hanging, and how people are grouped. Thank you so much for your honest review! I'm so sorry that your experience wasn't quite perfect. I always make sure to go over a list with couples in the weeks before the wedding for just this reason... so I'm not sure quite where we went wrong! As a small business owner, your happiness is everything! I want you to be completely satisfied. If there's anything I can do to improve your experience, please reach out to me via email and I'll do all that I can to make it right.